MacGregor Medical Center – San Antonio, a primary care medical practice, commits to providing quality medical care that is accessible and culturally sensitive. The ten board-certified physicians of MacGregor provide a broad spectrum of primary care services, with internists and family practice physicians. We offer preventive care, physicals and immunizations in addition to our main service of diagnosing and treating common and not-so-common ailments. Teams of hospital-based physicians care for our hospitalized patients in San Antonio’s major hospitals. We encourage each patient to identify a MacGregor physician as his or her primary physician. Please call for an appointment during our regular business hours. For those with electronic access through our portal, you may at any time request an appointment for a specific date and time range, and our weekday telephone staff will get back to you through the portal or by phone to confirm an appointment. Insurances usually cover a health maintenance exam (a “physical”) without charge, once per year. This exam is preventive, and includes screening for disease, determining risk for disease, and recommending preventive measures such as immunizations and screening tests, and we ask that you come in fasting. These exams do not include evaluation or treatment of existing problems, acute problems or medication management. We recommend that you set up a separate appointment for illnesses and chronic conditions. If you do have an evaluation for an illness or other health condition not related to the health maintenance exam, that may lead to additional charges to you as determined by your insurance company. 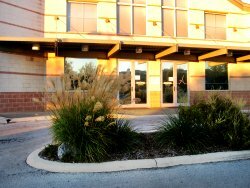 Our facilities are located across Fredricksburg Road from USAA, at the intersection with USAA Boulevard. We have ample free parking adjacent to our building, and our site is wheelchair accessible. Please click here to download an application for employment at MacGregor. Mail or drop off your completed application to apply for employment at MacGregor.